ORLANDO, FL—November 11, 2015 —As Orange County’s only open admission shelter, Animal Services is tasked with expecting the unexpected. The shelter receives an average of 30 cats and 20 dogs each day. Thirteen dogs entered the shelter on Friday, November 6, one of them being very different from the others. A334552, now known as Isabella, is a 4-year-old female mixed breed dog weighing 36 lbs. She was found at large near the intersection of West Central Boulevard and Ferguson Drive in the 32805 zip code and brought to the shelter shortly before closing. She did not have a microchip nor did she have a collar and tags, which would point to a possible owner. She struggled to bear weight on her right front leg due to a wound so deep the bone was visible. The sight was shocking to staff. 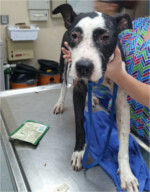 Isabella was taken to the shelter veterinarian for a full examination, which revealed she was emaciated, had chronic eye entropion and multiple scars to the face and legs. Pictures of Isabella’s wound quickly circulated on social media among the rescue community. That evening, ARK Rescue, a 501(c)(3) nonprofit organization partnered with Animal Services, committed to taking Isabella. She was picked up as the shelter opened on Saturday morning and transported to Altamonte Veterinary Hospital. Isabella has since had two surgeries to begin repairing the leg. The veterinarian and rescue group are hopeful the leg will be salvageable. She has a long road to recovery ahead of her. Isabella will soon be in the care of a foster home where she will be surrounded by toys, love and continued medical care, likely a foreign experience for her. Animal Services is taking this opportunity to encourage pet lovers to consider becoming a foster parent for local rescue groups. A full list of Animal Services current rescue partners can be found at www.ocnetpets.com.